This week has been a long one. Scott has been in Africa all week and does not get back until Wednesday. Although I have missed him greatly, I have been able to accomplish much with the quiet house all to myself. First, I finished the quilt label for the back of William’s first quilt. Here is the final result. 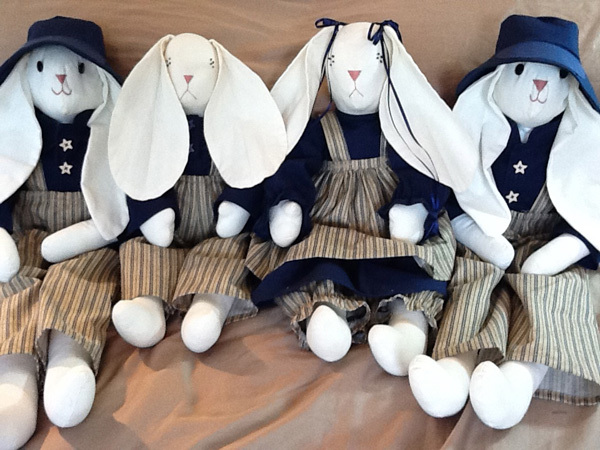 In addition to casting on a couple more Christmas gifts, the big accomplishment for the week was completing the new rabbit outfits for Mom’s four rabbits. I think they turned out so awesome! Unfortunately, I cannot show you the surprise that is on two of them since they are gifts (it’s covered up in the photo, no peeking). But, I think the recipients will really like having a part of mom’s past in their home. When I was redressing the two smaller, older rabbits, I found my signature on the backside and the date “1990.” That means that the two oldest rabbits are 21 years old. Gracious! So, all in all, it was a very productive week here at the house and a truly amazing week over in Buloba, Uganda. Scott was able to post a few times to his blog and the photos are amazing. Please wander over there and have a look. It is truly amazing what a common interest can do to bring people together. People who don’t speak the same language or that live on the opposite side of the world from each other can come together and fellowship around a shared interest in a game. I am so in awe of what the team accomplished over there on this trip and am really ready for him to be back home. I’m interested in the clear shoes you have. You said 8.5. Do they run true to size? I do not sell the clear shoes. I believe that I put a link to where I bought mine on the post where I talked about them.